Leinster survived late Blues pressure to briefly move top of the Pro12 table. Both teams struggled in poor conditions before Isa Nacewa's 58th-minute breakaway try saw Leinster pull clear. Josh Navidi's 77th-minute touchdown, converted by Rhys Patchell, brought the Blues back to within a point. Blues pressed, but Patchell's drop-goal attempt was charged down. A serious-looking injury to Wales centre Cory Allen will be a worry for national coach Warren Gatland. Allen, who returned to action in December after three months out with a hamstring injury, was taken off on a stretcher early in the second half after injuring his left leg. He was one of seven Blues players released from the Wales squad for the match. There was better news from an Ireland perspective with prop Cian Healy - missing so far in the 2016 Six Nations - looking sharp and powerful for the Irish province. Leinster's pack gave them the edge in the wind and rain with Ireland fly-half Ian Madigan kicking three penalties. Gareth Anscombe was on target twice to keep the Blues in contention. But it took a moment of inspiration from Leinster number eight Jack Conan to swing the advantage in the visitors' favour. He broke from deep in his own half before passing to Nacewa who raced over unopposed from 40 metres. 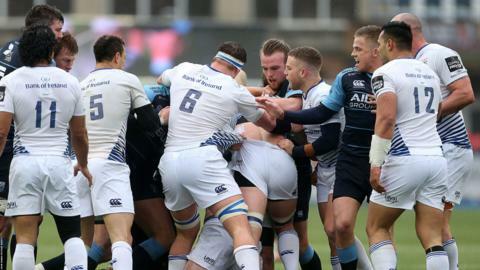 With the strong wind at their back in the second half, Blues dominated territory, but were undone by a series of handling errors in their opponents' half. However, when Navidi drove over from a lineout, Patchell's conversion brought the Blues back to within a point and set the scene for a frantic finish. But Leinster survived to record their 18th win in 19 matches against the Blues, who are ninth in the table. Cardiff Blues: Rhys Patchell; Alex Cuthbert; Cory Allen, Rey Lee-Lo; Blaine Scully; Gareth Anscombe, Lloyd Williams (capt); Thomas Davies, Kristian Dacey, Salesi Ma'afu, Jarrad Hoeata, James Down, Josh Turnbull, Ellis Jenkins, Manoa Vosawai. Replacements: Matthew Rees, Bradley Thyer, Taufa'ao Filise, Macauley Cook, Josh Navidi, Tomos Williams, Tom James, Dan Fish. Leinster: Zane Kirchner; Fergus McFadden, Garry Ringrose, Ben Te'o, Isa Nacewa (capt), Ian Madigan, Eoin Reddan; Cian Healy, Sean Cronin, Tadhg Furlong, Mick Kearney, Hayden Triggs, Rhys Ruddock, Jordi Murphy, Jack Conan. Replacements: Richardt Strauss, Peter Dooley, Mike Ross, Tom Denton, Dan Leavy, Nick McCarthy, Noel Reid, Adam Byrne.